My blog post on my opinion of what I consider to be the fastest video converter for Windows and Mac. I’ve used many video converters over the years on both Windows and Mac OS X and they vary a lot from fast to slow, from bare bones to jam packed with features. But the trouble I’ve had with them all was speed. 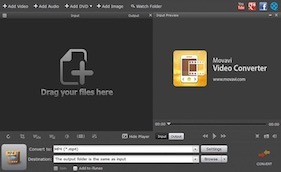 Videos depending upon your system specs and the resolution and format of the file can take a very long time to convert. So about a year ago I went on a hunt trying out various trials and demos of different video converting software and finally found Movavi Video Converter to be the fastest. While it is not necessarily the most full featured converter out there, it is the one that has converted video files the fastest for me, although of course speed vary’s from codec to codec. The version I am currently using is 5.X and so I can not speak for the new version 6.0. However if anything it should be faster. Unfortunately even the new 6.0 still lacks the ability to find and add information to the file, such as description and poster art. Which would be useful if you are converting a movie you either made yourself or are backing up one from your collection, this is a feature that is found in the converter of at least one of their rivals. I do personally recommend this software if you need a fast video converter for either Windows or Mac at an affordable price. Below is a list of system specification for both versions. Notice: I have not been paid for making this blog post nor do I work for Movavi. This blog post is just my personal opinions and experiences. Versions tested Mac version 5.1.2 and Windows version 14.X.